Pothos LimeSDR source setting for clocking source rolls down only one option: “Default”. What does one enter to switch the board to an external reference? I am running on Ubuntu. Hi, @Pinut, it’s possible that Pothos drivers do not expose the ADF4002 phase modulator. In that case, you need to switch the clock reference source before running your application. Another participant @cswiger found us a solution for switching to an external clock reference, using a small C program. See here. You then enter the frequency of your external clock source in Fref, MHz, and click Calculate R, N & Upload. 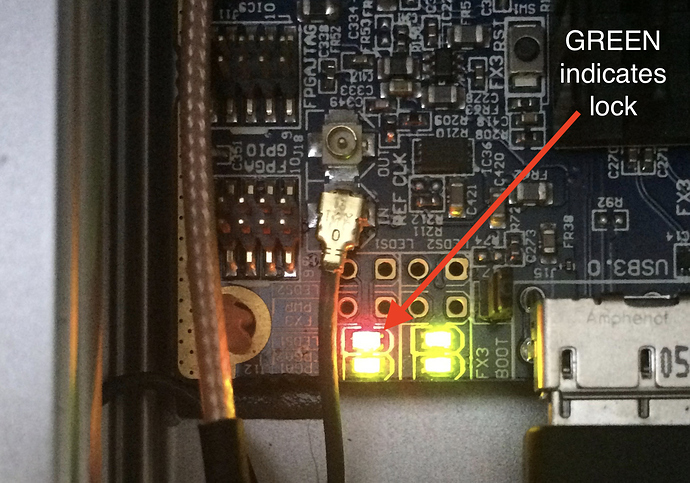 Assuming your external clock is connected (via onboard uFL connector J14), you should see a fourth LED on the board light up green.